Our range of products include stainless steel c channel. NeelKamal Steels is one of the leading providers of unimpeachable variety of Stainless Steel C Channel in the market. In order to maintain our reputation in the market we obtain only those products which are good in quality. NeelKamal Steels is one of the leading providers of unimpeachable variety of Stainless Steel C Channel in the market. In order to maintain our reputation in the market we obtain only those products which are good in quality. Our exclusive Stainless Steel C Channel are used in different industries.The Stainless Steel C Channel are extremely sturdy and are easy to weld. C-45 is the strongest types of steel which is present in our stores and has the highest demand in market for moderate properties like thermal conductivity and thermal expansion and wear resistance nature.These types of Stainless Steel C Channel are mainly used for the construction of steel structures, large diameter pipes, bridges, railway wagons, storage tanks, pressure vessels and boilers. 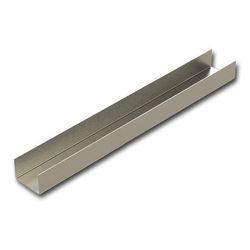 We also have weather proof Stainless Steel C Channel in our stores which are used in railcar construction. The Stainless Steel C Channel are made up of quality materials and are available in various ranges of metal grades in order to meet the requirement of the customers.